Crackle finishes are a specialty technique in the Scenic toolbox. Having a solid understanding of the science and theories behind our techniques can open up new possibilities and steer us straight when things go awry. 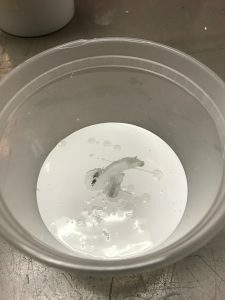 Guest Author Jason Strom lays out the science behind crackle, and samples a few different methods for one of our most useful tricks. I enjoy failure. I have spent a good majority of my career failing. I encourage my students to fail often, and hard. Intentional failure can mean that you are taking risks and looking forward. When paint fails, however, it is often considered less than positive. This can result in chipping or flaking paint. But what if paint failure was a good thing, and we could control it? Maybe, so that it fails in just the right way to appear old, worn out, and tired. That’s right. We’re talking about CRACKLE! So, buckle up, and let’s dive into our first session of Breaking Paint! Crackling paint is one of those treatments that comes up from time to time and can throw us Scenics into a whirlwind of worry. It is a treatment that can have a stunning effect onstage and bring a grounding sense of reality to a set. Before we jump into the recipes we should have a firm grasp on the basics of paint, so that we can effectively break the rules. 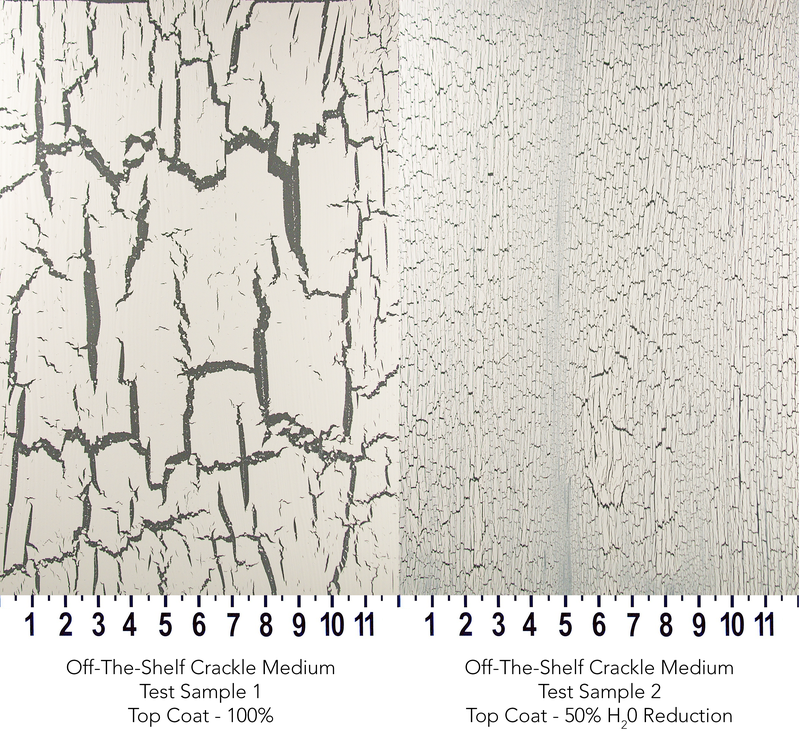 When it comes to crackle, the stages of drying are important. Depending on the method employed, we want to make one of these stages have an adverse effect resulting in the “crackle” look. 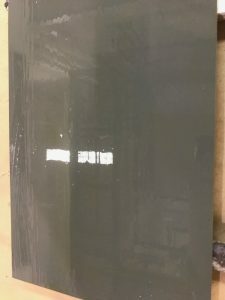 The majority of paint we work with as Scenics utilizes an evaporative curing process, meaning the vehicle and volatiles of the paint evaporate leaving the binder and pigment on the surface. This inherently means that paint shrinks as it dries. In some cases we can utilize the shrinking factor to aid in crackle. I other cases we can use the evaporating material as a catalyst for crackle. Either way, we need to know what to look for in the stages of drying. Wet Material – This is what comes out of the can. It’s completely fluid and still contains all of its vehicle and volatiles. Once applied to a surface, the wet film will begin the evaporative process. At this stage, it will transfer to your finger if you touch it. 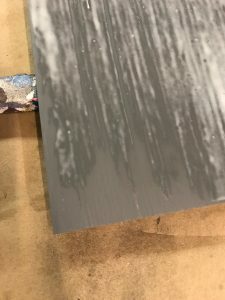 Film Formation – Once spread upon a surface, the “wet” parts of the paint, vehicle and volatiles, are racing to leave the surface. The binder and pigment are getting to know each other better. The outermost layer that is exposed to the environment will develop a skin. You can gently touch it without moving it, but may feel soft, squishy, or tacky depending on the material. Press too hard and you risk breaking the film and releasing wet paint. This is a relatively fast process: maybe a few minutes or an hour depending on material and thickness. Dry to Touch – The paint is continuing to expel the vehicle and volatiles as the binder and pigment become compressed together. The paint is no longer movable and can be touched without degrading the surface. However, even though we can touch it, the paint is still going through the evaporative process and is fragile. The surface will sometimes feel cool to the touch because of the evaporation. This stage can usually be seen at 30 – 90 minutes, but could be considerably longer depending on the material and thickness. Dry to Handle – Even more evaporative materials are leaving, the surface may still feel slightly cool and dry, but technically the paint is still considered wet. You can touch it, pick it up, handle it, but there is still a lot of work being done to get rid of the remaining vehicle. This can range from 2 hours to a number of days. After a couple days, the surface will no longer feel cool. Cured – The cured film has now hit room temperature and is considered solid. Under a microscope, the binder, pigment, and any other solids will appear tightly packed together with little space in-between. It can now be put into service. Do not be fooled. Even after this stage is hit, the surface will continue to expel vehicle and volatiles, and depending on the environment, may even absorb water from the air. Many artists are unaware that this stage can take weeks, months, or even a year to complete. For many, this timeframe seems silly considering a show might be up for a couple weeks, but consider a floor that has not fully cured!! Off-The-Shelf medium has hit the Dry-To-Touch stage. You can read on the side of most paint cans when the paint is serviceable, or when it is dry to touch. These are decent guidelines for using the product as directed. Being artists, we rarely use things “As Directed” and therefore these timelines should be considered akin to the Pirate Code: A decent guide to take with a grain of salt. 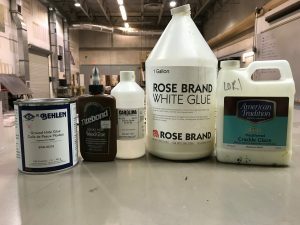 For a more in-depth approach to film formation and drying, check out the article from the Paint Quality Institute regarding the coalescing of acrylic mediums. Now that we have a rough understanding of what paint does, let’s make it do something it is not supposed to do. 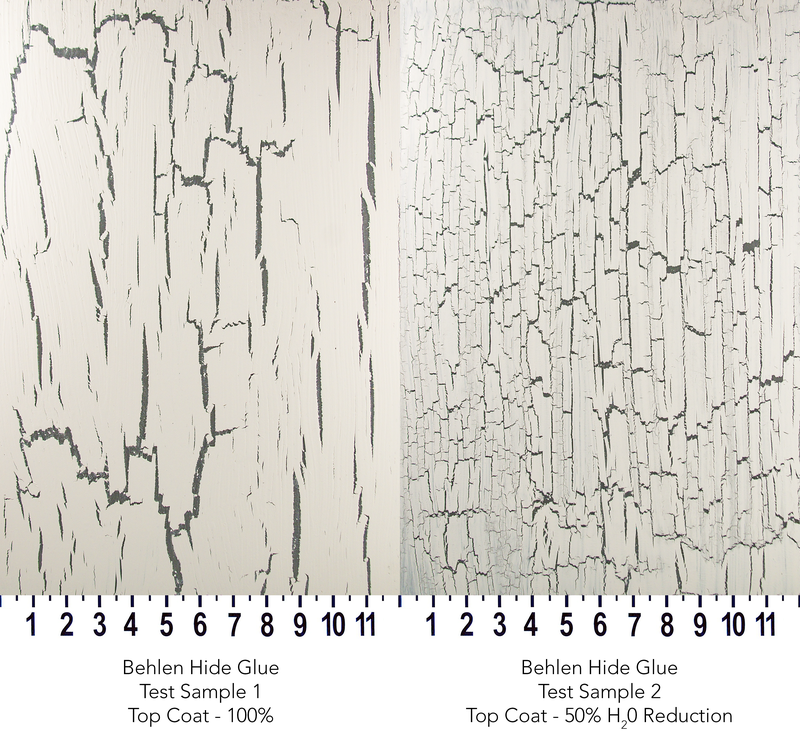 Below are a few methods of creating a crackle effect. There are many seasoned veterans out there with recipes that may vary from the ones below. Experience and research are your best guides. 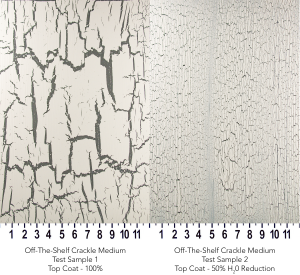 Crackle effects can vary to a great degree depending upon your climate, materials, and substrates. 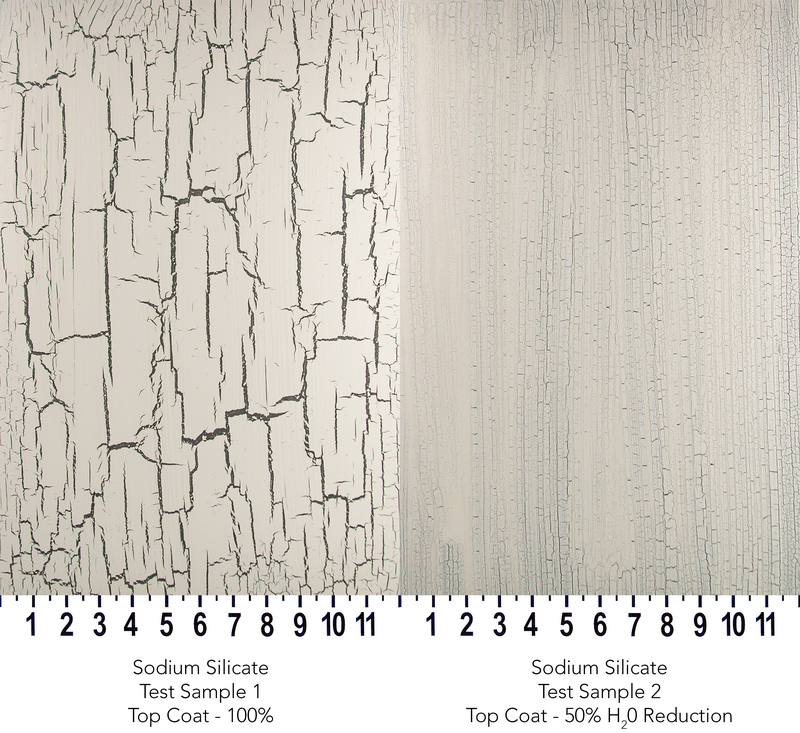 It is highly recommended that you sample these methods before you attempt it on a finished surface. Sampling should mimic as closely as possible the process you intend for the finished piece. Base: 50% BM Ultra-Spec 500 Flat White Int. / 50% Coronado Flat Black Int. Test #1 – The Top Coat was used at a 100% concentration, straight from the can. Test #2 – The Top Coat was reduced 50% with water. Primer and Base Coats were applied with an HVLP sprayer to avoid brush strokes and reduced with water to 30 seconds using a Ford #4 viscosity cup. I am not going to get into viscosity cups here, but the link above will take you to a decent overview. The top coats were performed with a 4″ Lay-In brush in a linear direction. All times listed below are based on the shop environment listed above. 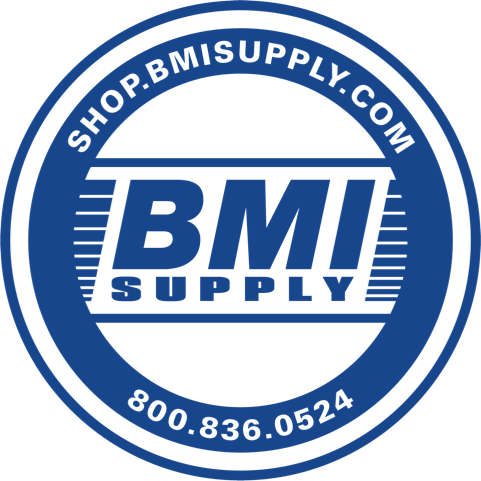 Your shop humidity and temperature will affect the times listed. Evaporative: A faster drying, brittle paint is applied over a thick, slower drying medium. The paint applied on top slows the evaporation of the underlying medium. Because the top coat is exposed, it dries before the undercoat. As the undercoat slowly loses moisture, it shrinks and causes the top coat to crack. Reactive: This is the epic bar fight we all live to see! Two materials are chemically incompatible and wage war on each other, breaking down the binder, and resulting in the cracked outer layer. This can also lead to massive paint failure, sometimes resulting in paint that does not adhere. You’ve been warned. Single Component: Paint products designed to crack when applied. These require no added materials or coatings. Ready to use straight out of the can. 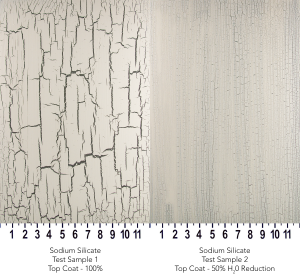 For this article we will be focusing on the first two types of crackle, Evaporative and Reactive. I will save the Single Component for another time. White Glue as it is developing a film. The bottom corner has nearly dried too much. 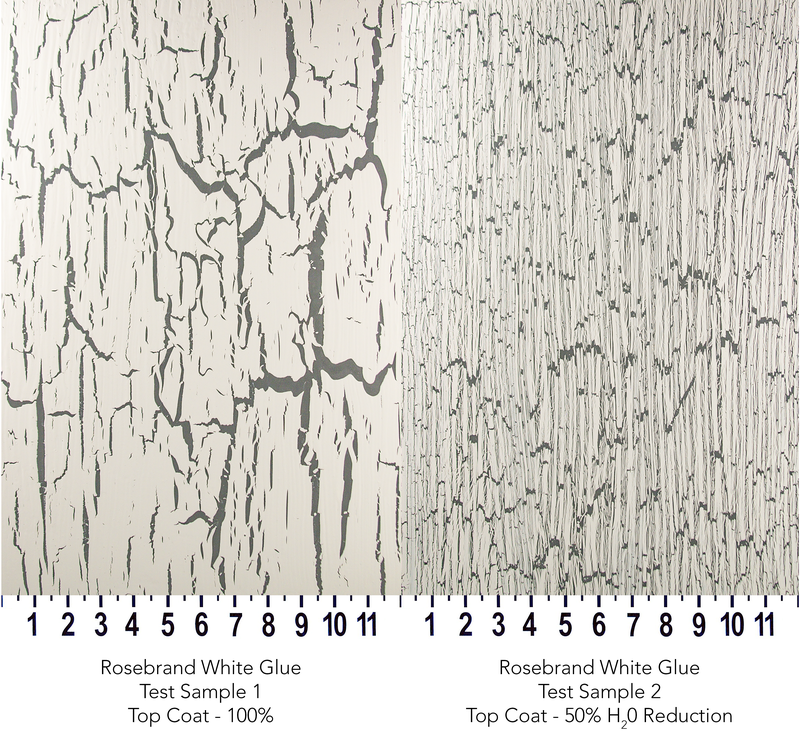 With our given substrate as prepared above, we applied a layer of Rosebrand’s White Glue using a 4” lay-in brush in a linear pattern. The glue was uncut, straight from the can. This was allowed to dry until the film formation stage, but not long enough to be considered dry to touch. Approximately 30 minutes. Once film formation occurred we GINGERLY brushed on a layer of Top Coat, as listed above. Take care not to tear open the film of the glue beneath. You need that film to be a barrier between the two materials. Allow to dry about 3 hours. 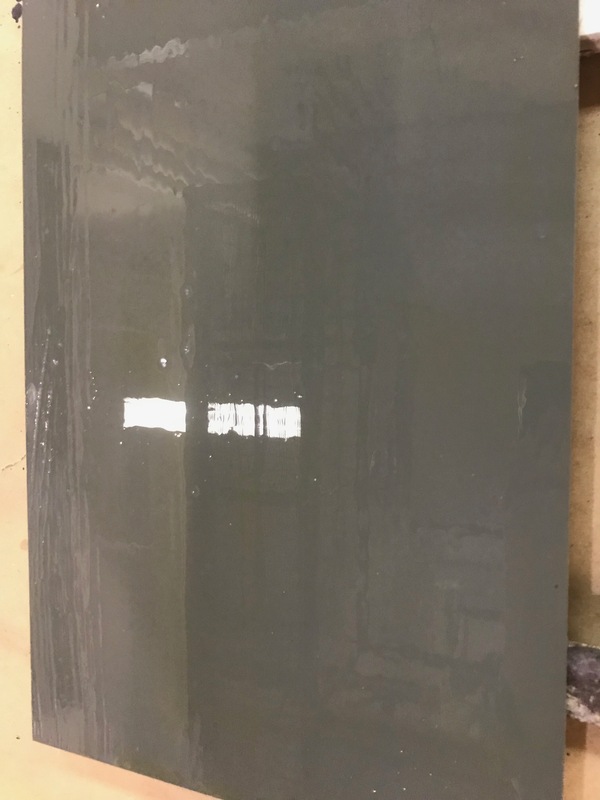 By sandwiching the glue between the substrate and paint layer, we have drastically affected the dry time. Any evaporative process that was happening in the glue has now slowed way down. The paint layer on top now has the advantage of drying faster. The crackle is now quite apparent as the glue layer has shrunk significantly and caused the paint layer to crack apart in places. It has reached the dry to touch phase, and the surface is cool to the touch. Upon returning the next morning, coffee in hand, there is not much change in the cracks from the previous step. These cracks tend to follow the brush strokes used in Step 2, however, many irregular cracks can be found. Thicker Top Coats result in significantly larger cracking, as seen in Test 1. Hitting the proper dry time of the glue is imperative. Waiting too long or not long enough will result in less cracks. Not breaking the film is a test in patience. We gently floated the Top Coat onto the glue surface. The reduced Top Coat was much easier to float. While this method worked well, we found that multiple tests led to some disasters. Mostly that the crackle would not appear at all. This process is all bout time: the glue has to be at the perfect film formation stage for this to work well. The cracks formed are quite interesting. In Test #1 we see many isolated, linear cracks that can be quite large and irregular. In Test #2 however, we see a beautiful example of sinew. The Top Coat has ripped apart in long striations. The color retention was very good. The crackle coat did not affect the white of the Top Coat in any way. A slight gloss is revealed in the cracks. 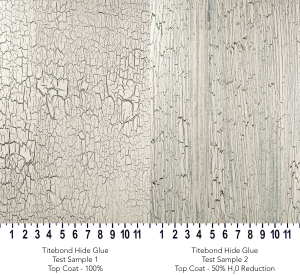 Hide and animal glues have a natural reaction to paint, and can be considered a “Hybrid” crackle. They fall somewhere between evaporative and reactive. The glue is allowed to dry to touch, where it has released most of its vehicle. When the paint is applied over it, the glue absorbs some of the liquid from the paint and it begins to swell, causing the paint to crack. At the same time the proteins in the hide glue react with the acrylic binder and cause the finish to break apart. A heat gun can be utilized to speed the process and encourage crack. 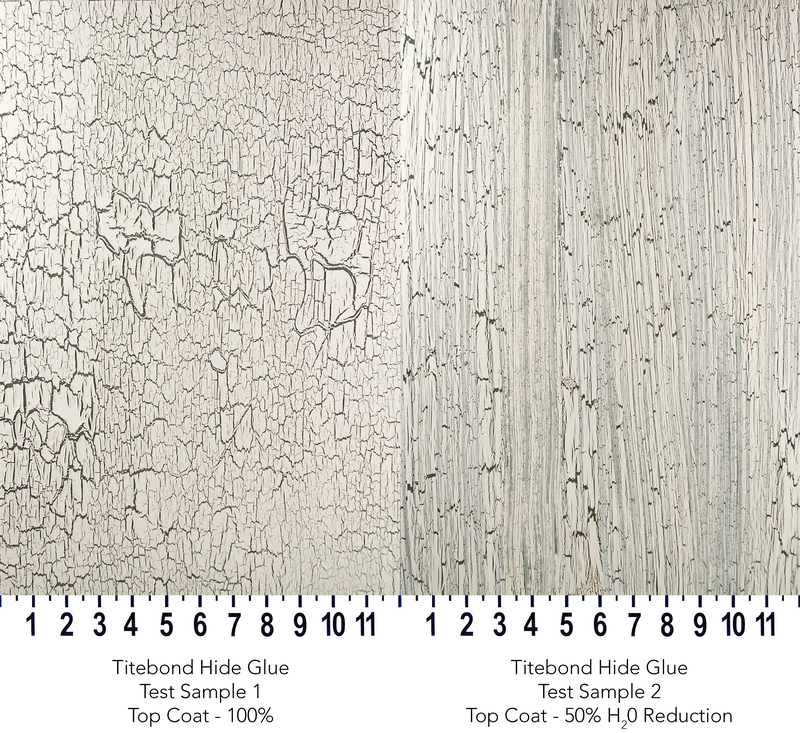 Back to our given substrate, we applied a layer of Titebond Hide Glue using a 4” lay-in brush in a linear pattern. The glue was uncut, straight from the bottle. This time, we let it dry to touch, but no more! If you scrape the back of your knuckle on the surface you should hear a squeak. Brush on a layer of Top Coat, as listed above. Once you put the paint on, don’t brush over it. Do your best to not fuss with the paint you have already applied. The reaction is fierce and moderately fast. Hot air will increase the size and length of crack. We used a heat gun, but a blow dryer can suffice. The range of dry time of the glue is a bit more open here. Dry-to-touch came around the 30 minute mark, and seemed to last about 15-30 minutes, depending on the environment and thickness of coat. Floating the Top Coat worked well. The trick is to apply quickly and do not touch it afterwards. The crackle process begins very quickly and any interruptions will have an adverse affect on the crackle. Multiple tests proved quite consistent. This has remained tacky for over a week after applying the crackle. The hide glue is extremely glossy and feels like the glue side of a sticky note. I would recommend sealing this with a clear finish to get rid of the stickiness. 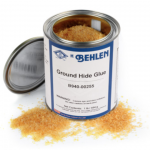 Hide glue that is as thick as this is attracting a lot of moisture from the air and will remain “soft” for a long time. Test #1 displays some decent alligator scaling with an occasional irregular crack. Test #2 is inconsistent in its crackle. Long striations of clean cracks. Less sinewing than the white glue. An amber shift is apparent in test #2, but test #1 held a cleaner color. Test #1 shows consistent peeling at the edges of the crackle, but feels durable. Because the hide glue has adhered to the paint, there is less fear of the paint completely peeling away. This happened because of the thickness of the Top Coat. The thinner version showed no signs of flared edges. Cooking hide glue is a great experience. Nope, I lied. It’s a little smelly and spoils quickly. Any glue that is leftover at the end of the day should be disposed of in accordance to local waste management policies. The chemistry is similar to the hide glue seen above. We have added my recipe for “cooking glue” to our Scenic Wiki and encourage you to read and add more info of your own. Back to our substrate, we applied two layers of hide glue. If your glue is thick, you can get away with one coat. If it is thin, you will want two coats. Sampling is the only sure way. Wait until it is dry to touch. Brush on a layer of Top Coat, as listed above. This is extremely similar to the Titebond Hide Glue process above. Hot air will increase the size and length of crack. We used a heat gun. 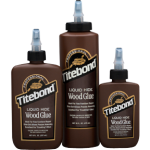 The range of dry time of the glue is similar to the Titebond above. The cracks did not show any signs of glossiness and did not show signs of color shift. The open time and cracking style are quite pleasant, and I can see using this in the future. Both tests showed clear angular cracks that were consistent from edge to edge. Color retention was clear, no amber shift in the Top Coat. Unlike the Titebond Hide Glue, the crackle had no peeling, and did not feel sticky in any way. These come in a variety of brands, but they are all similar in nature. 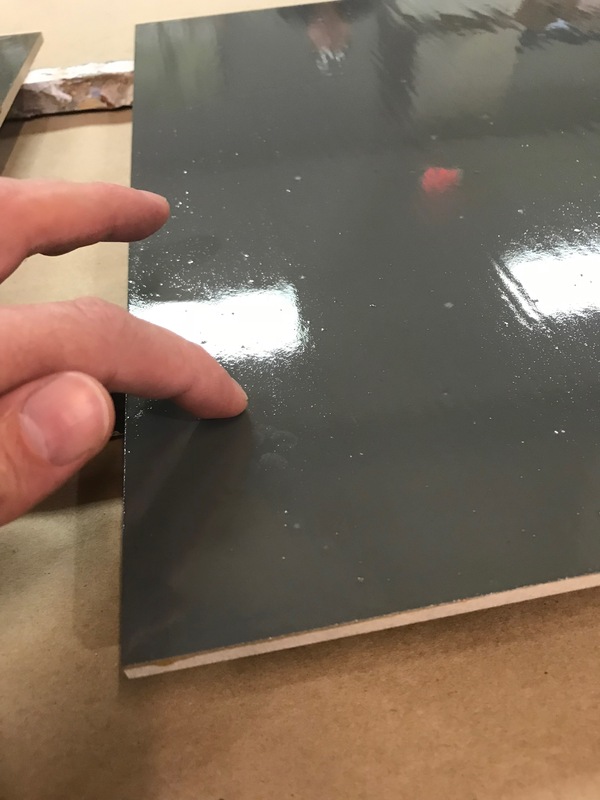 They react in a similar way to the hide glues used above, but more stable to ensure the product doesn’t spoil as quickly. Valspar, Behr, Milk Paint, and many others offer mediums that deliver a consistent crackle. Some of the mediums have proprietary chemistry, so finding information on them can be difficult. We followed the directions as specified on the container. Off-The-Shelf medium as it is setting up. Same substrate. We applied a layer of crackle medium with, you guessed it, a 4″ Lay-In. Wait until it is dry to touch, approximately 45 minutes. Brush on a layer of Top Coat, as listed above. Similar to the hide glues, the crackle started instantly. Hot air will increase the size and length of crack. We used a heat gun, but a blow dryer can suffice. Thicker Top Coats result in significantly larger cracking. The range of dry time of the medium is longer than the previous methods, about an hour, possibly longer. Floating the Top Coat is also similar to the hide glues, but reacts a bit faster. Don’t go over your brush strokes. Put it on and walk away. Test #1 displayed a few irregular cracks. Smaller cracks appear near the edges of the panel. Test #2 varied in size of crack depending on the pressure of brush stroke and amount applied. No color shift in the Top Coat. Slight glossiness revealed in cracks. Let’s science the crack out of this! The sodium silicate crackle is somewhat unique. 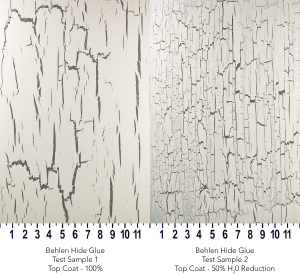 The Top Coat is combined with sodium silicate to create an unstable mixture, and when applied over a particular undercoating, will cause a reaction that delivers a very realistic crackle. There are no directions on the container for this. This recipe was honed over the years and has proven quite successful. Sodium Silicate also goes by the name Water Glass and can be sourced from chemical and ceramic suppliers. Apply a thin layer of dewaxed shellac over the surface, brushed linearly. We used Zinsser Seal Coat Universal Sanding Sealer – uncut. Wait between 3 – 7 minutes, the surface should be slightly tacky, but not wet. The ideal stage should be as the film is forming, or very shortly after. Your times may vary. While the shellac is shedding its denatured alcohol, mix the top coat: 95% paint / 5% sodium silicate (SS). In our tests, we found that a larger ratio of SS had little effect on the crackle outcome. If you are adding water to the mix, combine the paint and SS first, then add water. The mix of paint and SS will look slightly chunky. This is normal. Sodium Silicate will immediately begin breaking down the acrylic binder. DO NOT mix more than what you can use in a few minutes. There is a pot life of around 20 minutes. After the 20 minute mark, the mixture began to lose its effectiveness. Apply the Top Coat mixture over the tacky shellac trying not to brush over previous strokes. This is an extremely fast reaction. Do not fuss with your strokes. Once you apply it, leave it alone. A heat gun will have dramatic effects and is recommended. 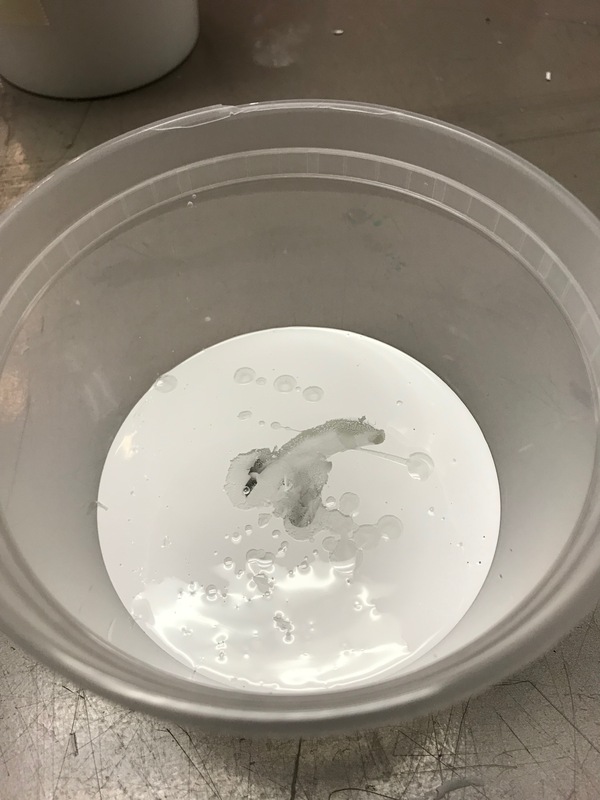 Sodium Silicate when poured into paint. The range of dry time is small. The important piece of information is the denatured alcohol in the shellac. The Sodium silicate is breaking down the binder, but is also reacting with the alcohol and causing the Top Coat to shrink. The shellac is like a piece of wax paper on a metal slide. It allows the Top Coat to move easily, giving better cracks. On a side note, if you have never taken a ride down a metal slide with wax paper, I highly recommend it. Multiple tests proved fairly consistent. Test #1 shows clear angular cracks. Small cracks appear near the edge of the panel. Test #2 shows hairline cracks in a ribbon formation. Both tests show slight amber shift of Top Coat. Crackle finishes like these are a specialty technique in the Scenic toolbox. Having a solid understanding of the theories behind it can open you up to new possibilities, and help you understand paint failure when things go south. While these are “Recipes”, I highly encourage you to experiment with various methods and try different paints, as they will render a different style of crack. Sample first. Fail Often and Fail Hard! Jason Strom is a graduate of North Carolina School of the Arts and has been with FSU as the Paint Shop Manager and Adjunct Faculty for 7 years. 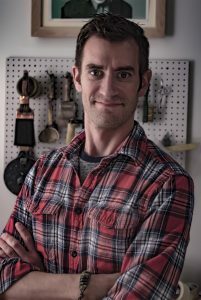 Jason’s experiences includes painting scenery for The McCarter Theatre, Maine State Music Theatre, John Creech Design and Production, LIV Design, Inc., Carnegie‐Mellon University, University of Pittsburgh, and for productions both on and off-Broadway. To see more work of his work, please visit his website. I can’t believe that crackle medium is still in the shop, Jason!